There are numerous laws, cases, and regulations to consider in analyzing whether your IRA can own an LLC (commonly referred to as an “IRA/LLC” or a “checkbook control IRA”). Despite the complexity of the law, your IRA can own 100% of the ownership interest of an LLC and you as the IRA owner may serve as the Manager of this LLC. This proposition was first supported by the case of Swanson v. Commissioner, 106 T.C. 76 in 1996 where the U.S. Tax Court held that it is not a prohibited transaction under IRC Section 4975 for a retirement plan to invest and own 100% of newly created corporation nor was it prohibited for the IRA owner to serve as an officer of that company where no salary or compensation was paid to the IRA owner. In summary, the U.S. Tax Court has supported the structure whereby a new created company is wholly owned by a retirement plan and managed by the retirement plan owner and that is the same rationale used in many IRA/LLC’s. So what does the IRS think about IRA/LLC’s? The IRS issued IRS Field Service Advisory #200128011 in April of 2001 which indicated that the IRS will not contend that there is a prohibited transaction when there is a newly formed and capitalized company that is 100% owned by a retirement plan. Keep in mind that both of these cases deal with newly formed companies and do not apply to LLC’s or corporations (or other companies) which a retirement plan owner may have already established. Also, it is possible to partner your retirement plan with others into one IRA/LLC but you must carefully consult with professional who are experienced in this area as there are numerous prohibited transaction issues that may arise when you partner your IRA with others. Serving as the Manager of the IRA/LLC allows the IRA account owner to enter into contracts on behalf of the IRA/LLC and to sign checks on behalf of the IRA/LLC. There are restrictions on the amount of work you may do (for example, if the IRA/LLC owned a property you may not work on the property) but you may oversee the administrative matters like the signing of contracts and checks. The prohibited transaction rules still apply to IRA/LLC’s in the same way they apply to your self-directed IRA so you still must pay careful attention to these rules and most consult with professionals who are competent in the laws that apply to retirement plans. 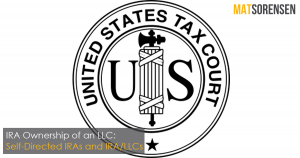 Moreover, an IRA/LLC is different from your typical LLC and the IRA/LLC documents should include numerous provisions which protect your IRA from a prohibited transaction. This doesn’t mean that an IRA/LLC should costs thousands of dollars. In fact, our law firm sets IRA/LLC’s up for $750 plus the state filing fee if the IRA/LLC is owned by one IRA or $1,500 if owned by multiple IRA’s or partners. In the end, an IRA/LLC can be a powerful tool to gain more control of your IRA’s investments but you must do so with adherence to the rules and laws that apply to your IRA. Written by Mathew Sorensen, Attorney at Law and Partner at Kyler Kohler Ostermiller & Sorensen, LLP, a law firm assisting self directed retirement plan owners across the U.S. for over ten years from offices in Arizona, Utah and California. To learn more about our law firm, please visit our website at ww.kkoslawyers.com or call us at 435-586-9366.